Science After Retirement: How do rain gardens process runoff and rainfall? Through the Vacant to Vibrant Project, we have been able to obtain preliminary performance data for three rain gardens in Cleveland. The data are from a rain garden in the Cleveland Botanical Garden and two Vacant to Vibrant parcels in Cleveland’s Woodland Hills neighborhood. The remote monitoring station at 10607 Hulda Avenue (figure 1) consisted of an Onset RX3000 series data logger with cellular communication, soil moisture probes (Onset Part Number S-SMC) deployed at 3 cm, 10 cm, and 20 cm and a soil temperature probe (Onset Part Number S-TMB) deployed at 3 cm in the primary rain garden. 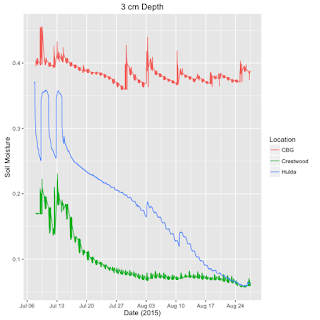 At the other two experimental parcels (10611 Crestwood Avenue and 10411 Shale Avenue), we installed buried Onset H21 data logger and deployed a soil temperature probe at 3 cm and soil moisture probes at 3 cm, 10 cm, and 20 cm in the primary rain garden. The H21 data logger in the Shale experimental parcel failed due to water damage. 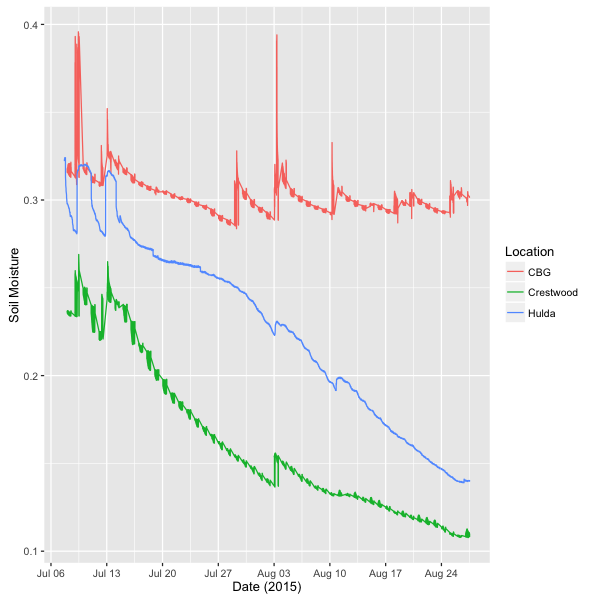 Monitoring stations in the Hulda and Crestwood parcels, however, provided continuous data logging from July 7, 2015 through 2016. 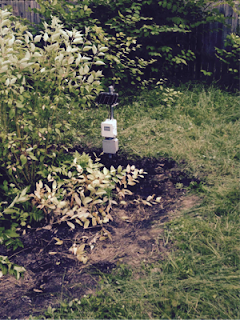 In June 2014, we installed the H21 data logger and three soil moisture and one soil temperature sensors (using the same design as with the Shale and Crestwood parcels) in the experimental rain garden of the Cleveland Botanical Garden. 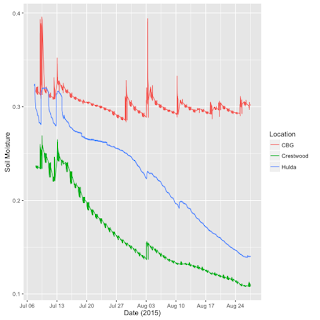 We have been monitoring the Cleveland Botanical Garden rain garden continuously since June 2014 and have used it for various experimental and calibration studies. Figure 1. Remote logging station in rain garden at 10607 Hulda Avenue. Complementing the rain garden monitoring, we have also obtained estimates of rainfall from three sources: archival from U. S. National Weather Service for the KCLE station and from two weather stations. One weather station was in the Woodland Hills neighborhood at the Green Corps Woodland Avenue Farm. It is a remote weather stations consisting of an Onset RX3000 series data logger with cellular communication and rain gauge (Onset Part Number S-RGB), solar radiometer (Onset Part Number S-LIB), temperature and relative humidity (Onset Part Number S-THB), and wind speed sensors (Onset Part Number S-WSA). 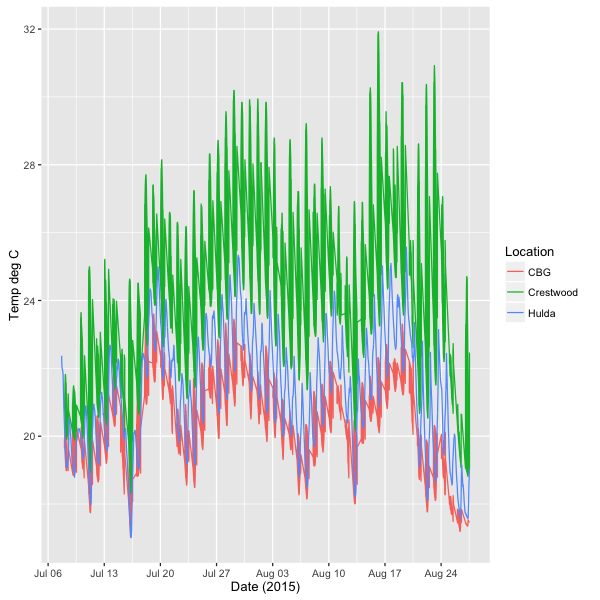 The Woodland Hills weather station was active from August 5, 2015 to November 5, 2015. We also have weather data available from an H21 data logger equipped weather station at the Cleveland Botanical Garden. We installed this weather station in June 2014 using the same sensor set as the Woodland Hills weather station. 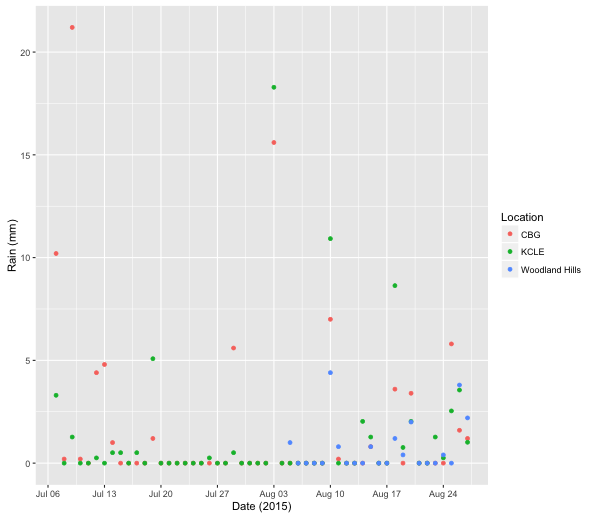 The results reported here are for the summer of 2015 (July 7 to August 27). 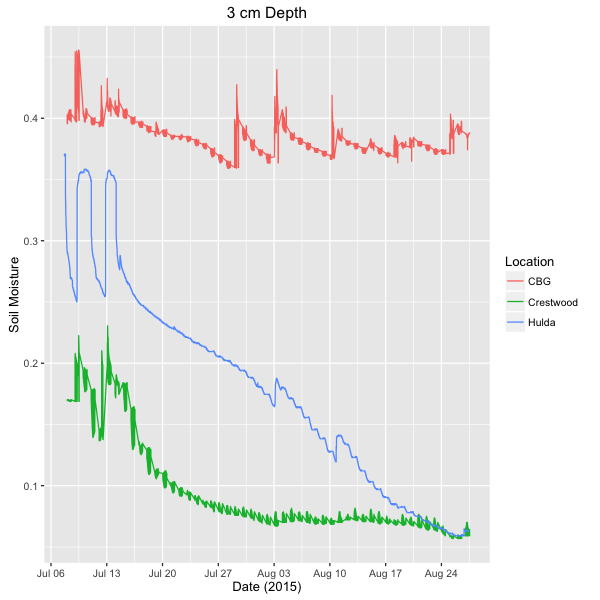 Figure 2 shows the depth-weighted soil moisture for each of the three monitored rain gardens. The dynamics of water content in each rain garden reflect the differences in patterns of soil temperature (Figure 3). The CBG rain garden had the highest soil water content and lowest soil temperature and the Crestwood rain garden had the lowest soil water content and highest soil temperature. The Hulda rain garden was intermediate for both soil water content and soil temperature. 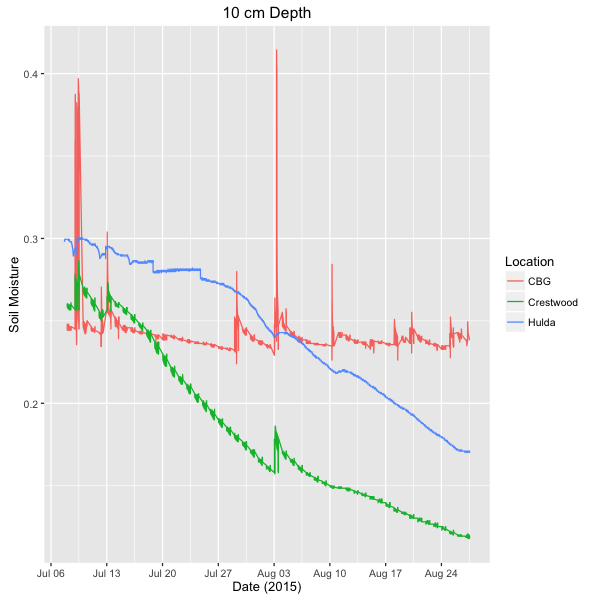 We calibrated all soil moisture sensors prior to deployment. Although we detected bias in the sets of sensors used for each of the rain gardens, the biases were not consistent across types of calibration media (air, water, and damp potting soil mixture). Therefore, we did not try to analyze gradients of soil moisture within each of the rain gardens. 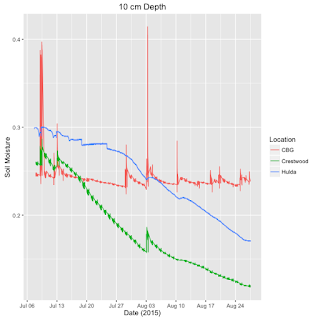 Rather, we compared patterns of change in soil moisture at each of the sampled depths (3 cm in Figure 4, 10 cm in Figure 5, and 20 cm in Figure 6). The patterns are similar to those for the weighted average soil moisture measurements (Figure 1), and they reflect the patterns of precipitation (Figure 7) observed at various weather stations. In general, however, the rain garden at the Cleveland Botanical Garden seemed to have much higher rainfall than measured at the other two weather stations; indicating that the higher water content of the rain garden at the Cleveland Botanical Garden is the result of lower soil temperature and higher precipitation. Figure 8 shows the relationship between rainfall measured at the Cleveland Botanical Garden and at the KCLE station of the U.S. Weather service. These two locations are 13.5 miles apart and the residual variability between the two stations reflects the regional variation in intensity of rainfall events. Figure 2. Patterns of change in weighted average soil moisture at three rain gardens: Cleveland Botanical Garden demonstration rain garden and in Woodland Hills rain gardens at 10611 Crestwood Avenue and 10411 Hulda Avenue. Figure 3. 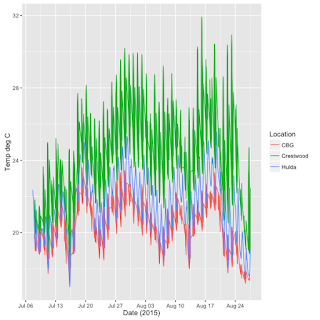 Patterns of change in surface soil temperature at three rain gardens: Cleveland Botanical Garden demonstration rain garden and in Woodland Hills rain gardens at 10611 Crestwood Avenue and 10411 Hulda Avenue. Figure 4. Patterns of change in soil moisture at 3 cm depth in three rain gardens: Cleveland Botanical Garden demonstration rain garden and in Woodland Hills rain gardens at 10611 Crestwood Avenue and 10411 Hulda Avenue. Figure 5. 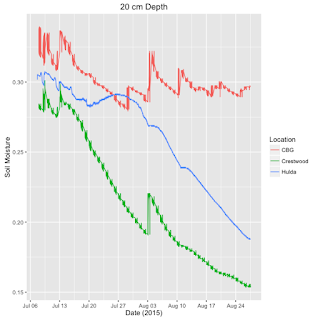 Patterns of change in soil moisture at 10 cm depth in three rain gardens: Cleveland Botanical Garden demonstration rain garden and in Woodland Hills rain gardens at 10611 Crestwood Avenue and 10411 Hulda Avenue. Figure 6. 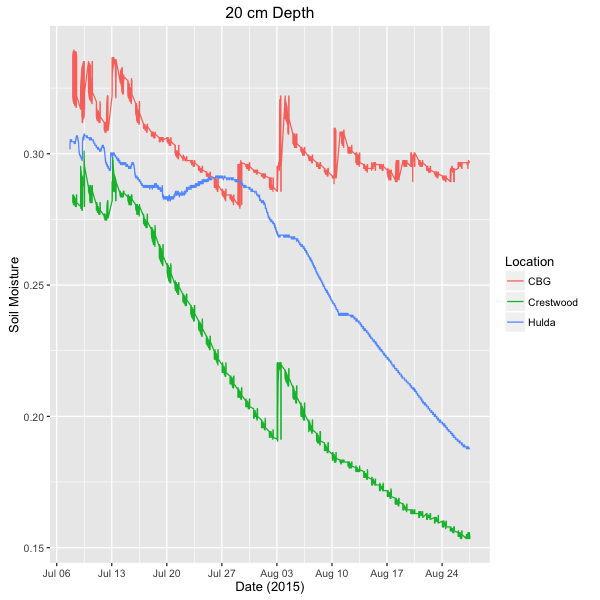 Patterns of change in soil moisture at 20 cm depth in three rain gardens: Cleveland Botanical Garden demonstration rain garden and in Woodland Hills rain gardens at 10611 Crestwood Avenue and 10411 Hulda Avenue. Figure 7. Comparison of measured daily rainfall at three locations (U.S. Weather Service at KCLE, project weather station in Woodland Hills, and project weather station at the rain garden in the Cleveland Botanical Garden). 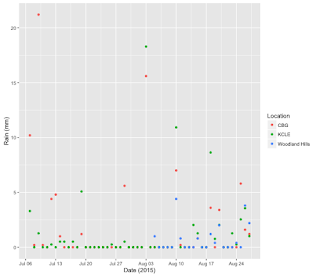 The Woodland Hills weather station was not deployed until August 5, 2015. Figure 8. 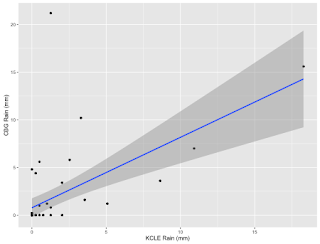 Comparison of daily rainfall estimates from KCLE archives and measurements at the Cleveland Botanical Garden weather station for the period July 7 to August 27, 2015 with regression line (correlation coefficient, 0.583, p<0.001).